Starting to feel festive? Looking for Christmassy nail ideas? 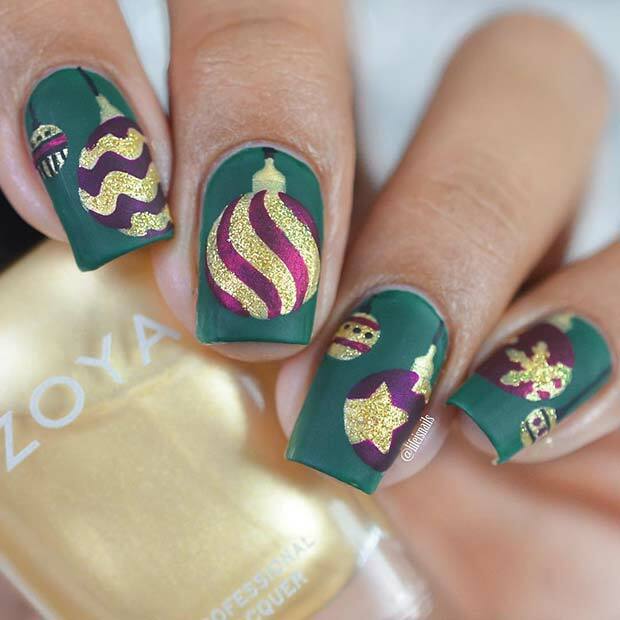 Then you need to check out 10 of the best holiday nails we found on Instagram! We have sparkly snowflakes, nail art inspired by Christmas treats, designs with classic Christmas characters and more. There is something to suit everyone, whether you are going to a glam Christmas party or want to celebrate the season in style! This list is sure to get you into the Christmas spirit. We are starting off with these snowflake and glitter holiday nails. 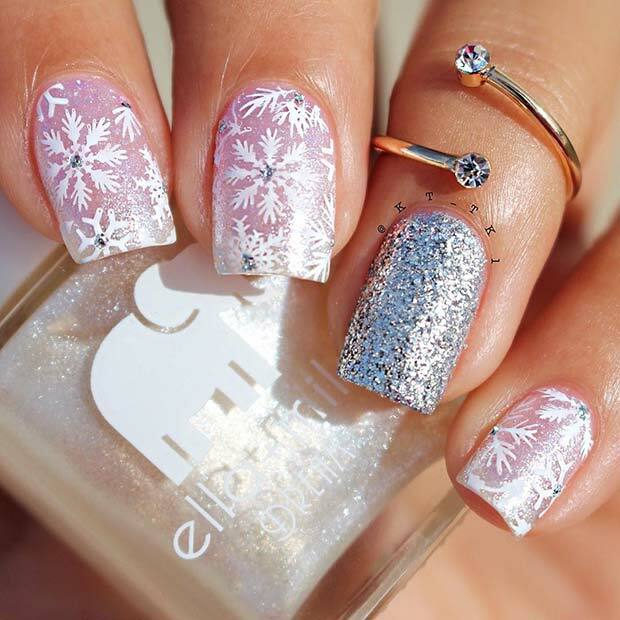 The nails are shimmery with different white snowflake designs and small, sparkling crystals. There is also a silver glitter accent nail. 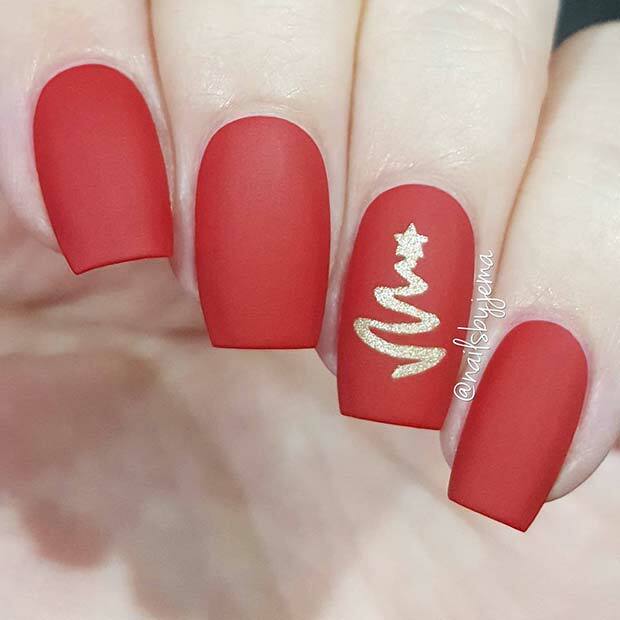 Nails like these are perfect for Christmas! Recreate the whole look or maybe try just one snowflake design on all nails. Our next idea is a design inspired by Santa. 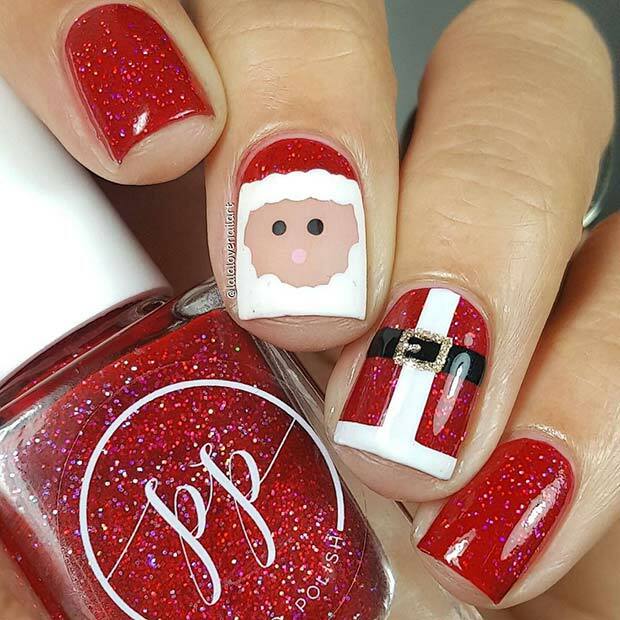 Some of the nails are red and glittery while two are accent nails with Santa nail art. One nail features Santa’s face and the other his suit. It is a cute and festive nail idea. This design will suit all nail lengths and shapes. It wouldn’t be Christmas without gingerbread! 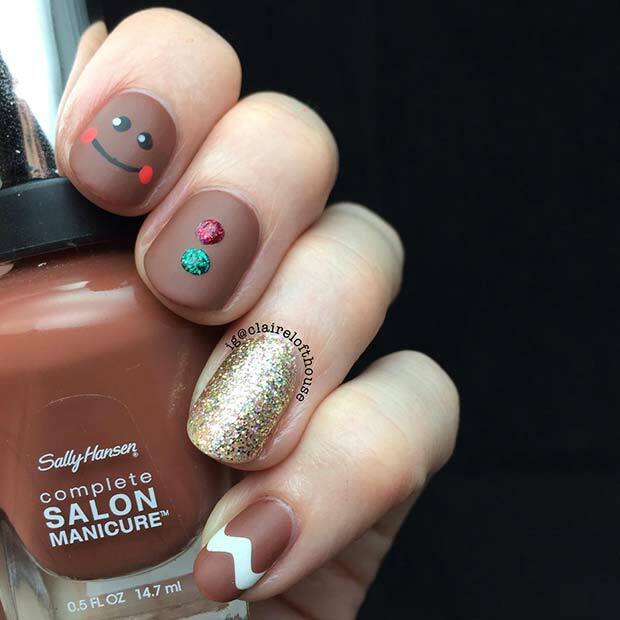 So, next we would like to show you are these cute nails inspired by the delicious holiday treat. The nails feature all different gingerbread style designs. The first one has a cute face, the second one has gingerbread buttons, next we have a festive gold nail and the last visible nail features gingerbread with white icing. Recreate the whole look or choose one of the nail designs to try. The holiday and winter seasons provide lots of inspiration for nail art! Here we have a stylish and cute idea. The nails have been painted with a red and green plaid pattern with gold glitter and white nails. We love this idea because it uses plaid (a winter must-have) with festive colors and glitter. 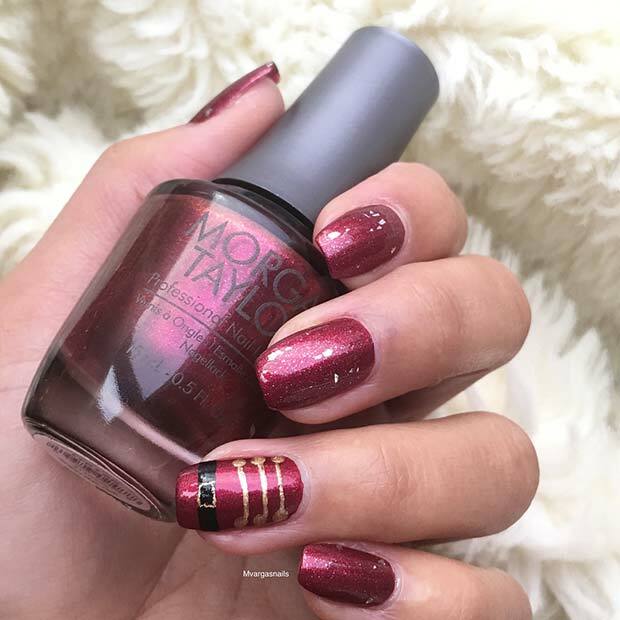 If you are looking for an elegant nail idea for the holiday season, these nails may be perfect! 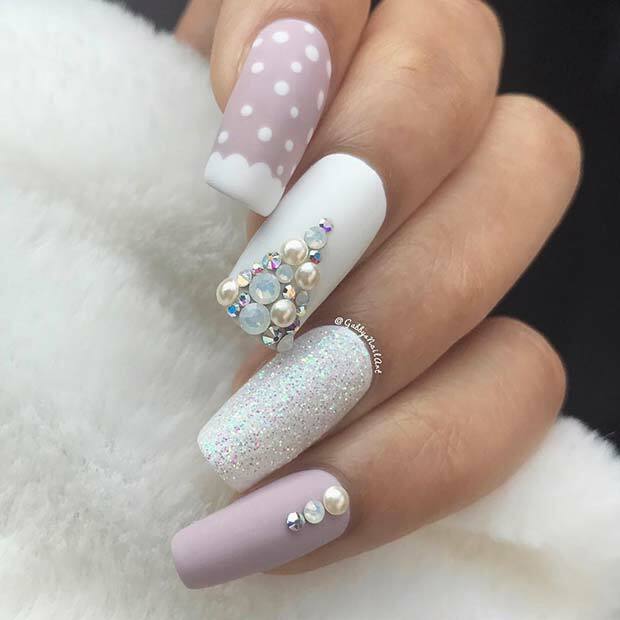 All of the nails are a light shade with beautiful patterns and gems. One nail is snowy, the next has a crystal Christmas tree design, then there is a glitter nail and finally three beautiful gems. Nails like these would be perfect for a party. Next, we have a stylish holiday nail idea to share with you. The nails are dark red with silver and gold polka dots. We love the colors used here as they are perfect for the season. It is easy to recreate this look, all you will need is a red, gold and silver polish and a dotting tool. Use all three colors or try just red and gold or red and silver. Our next idea features a wintry snowflake design. The nails all have different designs including candy cane inspired stripes, festive glitter, and a statement snowflake. 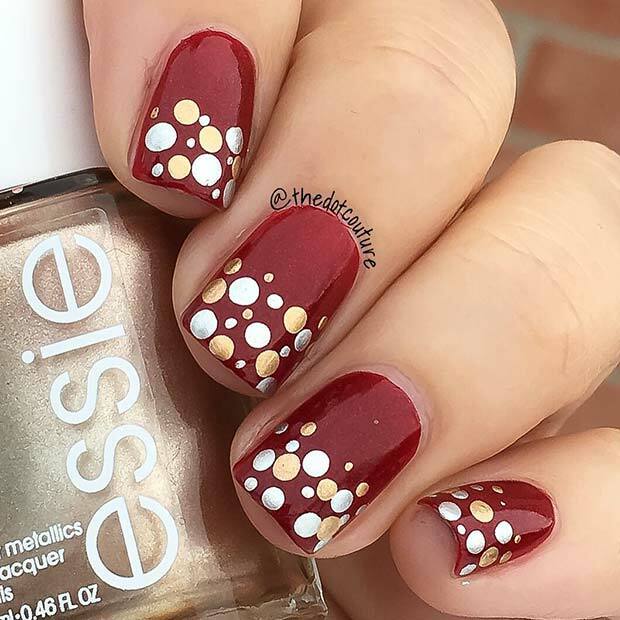 These are beautiful and simple nails for the holiday season. Easily recreate the design with the help of this quick YouTube video by BadGirlNails. Enjoy! Baubles are a must-have for the Christmas tree. These nails have been inspired by the decorations. Each nail features a different bauble with all different patterns. This is such a cute and Christmassy idea. You can recreate this look or you can use similar baubles in colors of your choice. The next idea we have to show you has been inspired by another Christmas classic – the Nutcracker. These nails are a dark red with one accent nail that has been based on a Nutcracker’s uniform. This is a traditional holiday idea that will suit any nail shape and length. Looking for simple holiday nails? Then this idea is for you! These nails are a bold, Christmassy red with one accent nail. The accent nail features a creative, gold glitter Christmas tree. This is such a chic and stylish nail idea that will bring festive glitz and glamour to your look. You can recreate these in a matte or glossy finish.